Punjab Remote Sensing Centre, PAU Campus, Ludhiana has recently given notification of 03 Research Fellow, Research Associate, and Research Scientist Vacancies on the contract basis. You can apply for the PRSC Recruitment 2019 on or before 25.02.2019. Punjab Remote Sensing Centre Recruitment 2019-20 latest notification is out. As per the Notification, there are 03 Research Fellow, Research Associate, and Research Scientist Vacancies. The educational qualification is the Post Graduation degree and Ph.D. in the relevant subject. The maximum age limit is 37 years. If you are looking for Jobs in Punjab Remote Sensing Centre then this article is going to be very helpful for you. Name of Department: Punjab Remote Sensing Centre. Last Date: 25 February 2019. Research Fellow: Masters degree in the relevant subject along with at least 01-years experience. Research Associate: Ph.D. in the relevant subject. Research Scientist: Ph.D. in the relevant subject. The maximum age limit is 37 years on the date of interview. 05 years in the case of SC/ ST/ BC/ PHC with due supporting certificate and attested as per rules. Research Fellow: Rs. 27000/- consolidated. Research Associate: Rs. 30000/- per month consolidated. Research Scientist: Rs. 35000/- per month consolidated. The selection is going to be on the basis of the written/ practical and skill test. Rs. 1500 for Research Scientist, Rs. 1200/- for Research Associate and Rs. 1000/- for Research Fellow by cash receipt or Demand Draft in the favor of Director, Punjab Remote Sensing Centre payable at Ludhiana. You can send your application along with the bank draft, and other relevant documents to the Office of Punjab Remote Sensing Centre (PRSC), PAU Campus Ludhiana-141004 on or before the due date. You can check the PRSC Result or Interview List from the official website. Punjab Remote Sensing Centre, PAU Campus, Ludhiana has recently given notification of 07 Scientist SC Vacancies on the contract basis. You can apply for the PRSC Recruitment 2019 on or before 10.01.2019. Punjab Remote Sensing Centre Recruitment 2018-19 latest notification is out. As per the Notification, there are 07 Scientist SC Vacancies. The educational qualification is the Post Graduation degree in the relevant subject. The age limit is 18 to 37 years for the Scientist post. If you are looking for Jobs in Punjab Remote Sensing Centre then this article is going to be very helpful for you. Last Date: 10 January 2019. The candidate should have a post-graduate degree or equivalent in the relevant subject with good knowledge of RS/ GIS. The candidate should have passed the Punjabi up to the matriculation level. The age limit is 18 to 37 years as on 01.01.2019. SC/BC: 05-years over and above the normal recruitment age. PWD: 10-years over and above the normal recruitment age. Ex-Serviceman: As per the Punjab Govt. Instructions. Rs. 15600-39100/- + 5400/- Grade Pay + Plus allowance. Based on the bio-data, a screening will be conducted to shortlist the candidates/ applicants for interview, written/ practical test as may require and applicable. Rs. 1000/- by cash receipt or Demand Draft in the favor of Director, Punjab Remote Sensing Centre payable at Ludhiana. 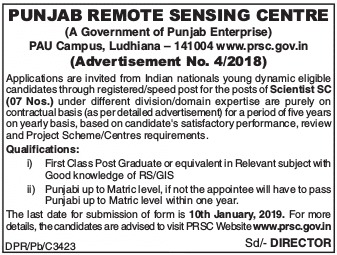 You can send your application along with the bank draft, and other relevant documents to the Office of Punjab Remote Sensing Centre (PRSC), PAU Campus Ludhiana-141004 on or before 10.01.2019.